Creating ecards with free templates and examples. Drawing ecards has never been easier. Ecard is an electronic decorative card sent to convey good wishes. Ecards are usually given on special occasions such as birthdays, Christmas or other holidays, they are also sent to convey thanks or express other feelings. Ecards are more environmentally-friendly than paper cards. They are more flexible since 1 click on the mouse can send it to the receiver no matter where he is. 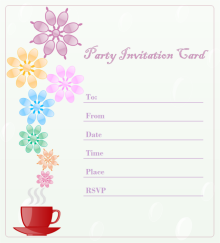 Ecards are also inclusive and cost-effective. Actually, designing ecards can be very funny. To DIY ecard yourself can make it special and memorable. 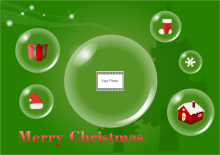 Come and act now to free download the ecard software to design your own ecards. Our Ecard software is the best and easiest tool to DIY ecards. It is perfect for both beginners and professional designers with built-in shapes, templates and advanced drawing tools. It is absolutely cost effective with lifelong upgrade. Just try it for free. You will surely love it. Our software supports to create the following types of ecards. This is a Christmas car example. You can edit it or insert your own photos or images. Save time and effort by using ready-to-use Christmas clipart. Learn how to design Christmas cards. View more Christmas card examples. This is a highly artistic and beautiful New Year card. You can insert your photos. Explain each photo and record your big moments in the past year. This will surely be the most meaningful New Year Card for your families and friends. Find more New Year card examples through this link. This is a creative Valentine's Day card. The cartoon style design makes it unique and meaningful. Learn how to DIY Valentine's Day Cards. See more personalized Valentine's Day card examples. Presented on the right is a nice party invitation card. It is made of simple basic shapes and predrawn clipart. You can change the overall style with 1 click. Here are more Invitation Card Examples for your reference. Get Clipart for DIY Ecards. 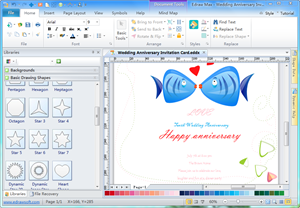 See how to edit shapes in ecard software. Click the right picture to download this Halloween Card. Click here for more Halloween card examples. Find more Halloween cliparts here. A simple yet meaningful ecard for thanksgiving. Suitable for both western and Eastern cultures. See another Thank You Card.